Trinidad and Tobago’s emotional World Cup qualifying victory over the United States last Tuesday have propelled them to third in the Caribbean Football Union rankings after the release on Monday of the World Rankings by the sport’s world governing body. 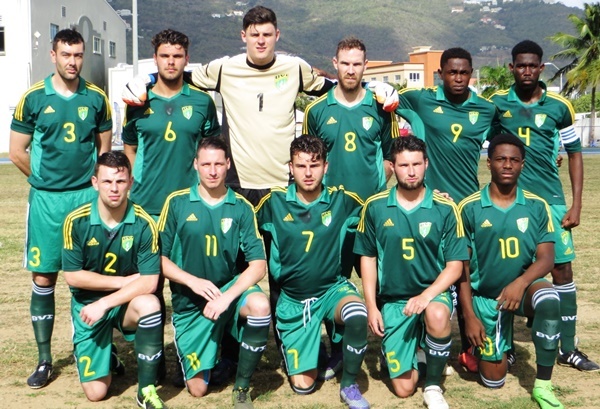 The BVI remain 205th overall and 33rd in the CONCACAF Sub Region. The Soca Warriors earned a significant jump in the World Rankings issued by FIFA, moving up 16 places to 83rd, making them the biggest movers in the Caribbean, following their emotional 2-1 victory that zapped the United States’ claims for a place in the 2018 FIFA World Cup in Russia. The result was sweet revenge for the two-island republic, after the Americans dealt them a similar blow in qualification for the 1990 FIFA World Cup in Italy. Though the Soca Warriors lost 3-1 on the road against Mexico two Fridays ago in San Luis Potosi, that did not seem to hurt them too much and they have move past Curacao in the CFU Rankings, leaving only Haiti and Jamaica ahead of them, with St. Kitts and Nevis rounding out the top five. The Haitians drew 3-3 with hosts Japan in an international friendly last Tuesday in Yokohama in their first action in more than a year, but it was still good enough to help them earn the CFU top spot that they have held for the last 13 months, though they dropped eight places in the World Rankings to 56. With very few matches played by other regional sides since the previous rankings, it meant that many of them have lost ground in the rankings and some have benefitted thanks to results from elsewhere around the world which has also seen a shake-up in the rest of the CFU top-10. Antigua and Barbuda and Suriname have held onto their places in the top-10, but has swapped places, being sixth and seventh respectively. The Antiguans however, were the biggest losers in the region, dropping 19 places in the World to 136th. Grenada and Barbados have been the great beneficiary of the slide out of the top-10 by Guyana. They are now eighth and ninth ahead of the 10th-placed Dominican Republic with the Barbadians making a notable 10-place jump in the World Rankings to 160th. The Guyanese dropped nine places in the World Rankings to 165 and was 11th in the CFU. FIFA announced that Peru have climbed into the top-10 of the World Rankings for the first time in an edition marked by the recent, decisive FIFA World Cup qualifiers. The damage done to the infrastructure of Football by the two Hurricanes has not gone unnoticed by the World Governing Body, who have sent the Regional Director for Africa and the Caribbean on a fact finding mission to see what help is needed.